EyeCare Associates has partnered with TLC Laser Eye Centers to provide you the most experienced laser eye surgery care in Tulsa, OK. At our Tulsa Laser Eye Surgery Center, our friendly and professional staff will provide you with an exceptional patient experience. During your free consultation, we will take you on a tour of our state-of-the-art facility and answer all your laser eye surgery questions. 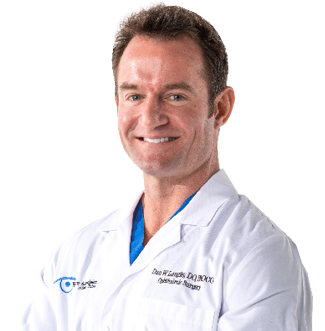 Laser eye surgeon Dr. Daniel Langley is a skilled refractive and cataract surgeon, he has earned several awards in excellence and received a lifelong education award from the American Academy of Ophthalmology. The TLC Tulsa LASIK Center is a leading Custom LASIK provider in the Tulsa and surrounding area and sets the Gold Standard for outstanding patient experiences and outcomes. Schedule a Free LASIK Consultation in Tulsa today! Native Tulsan, in family practice since 1976. Graduate of Univ of Oklahoma and Southern College of Optometry. Dr. Gumm recieved his Doctor of Optometry from Northeastern State University. He is a member of the Oklahoma Association of Optometric Physicians and American Optometric Assocation. Dr. Gumm is also involved in local organizations, including the Stillwater Chamber and Public Education Foundation.